Educational, interactive preschool/kindergarten music, designed and developed by a preschool music specialist to teach early childhood concepts, skills, language cues and specific information using appealing, harmony-rich folksy music as a tool to teach. 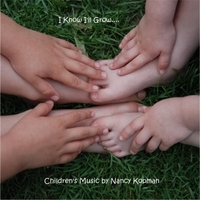 Nancy Kopman's educational, interactive music has been carefully developed and designed to teach children important early childhood concepts, skills, language cues and specific information (planets, vowels, continents, oceans, counting, initial letter sounds, opposites and much much more) using catchy, appealing (non irritating) music as a vehicle to reach children in a deeply meaningful way. Parents, caregivers, teachers, school administrators, pediatricians, kids' bloggers and therapists who have discovered Nancy's music worldwide agree that Nancy's music reflects her genuine understanding of how children connect with music at their level. The effects of using Nancy's songs as part of a child's day are quickly obvious. Your students/children will be able to easily access the information they retain from practising Nancy's songs for years to come.